The ET-800 Table allows you to conveniently operate two ophthalmic instruments such as Perimeters and Computer, Fundus Camera and Computer, etc., allowing for greater flexibility. Patients won’t have to bend or stretch to meet the instrument. The ET-800 offers an excellent range of motorized height adjustment. 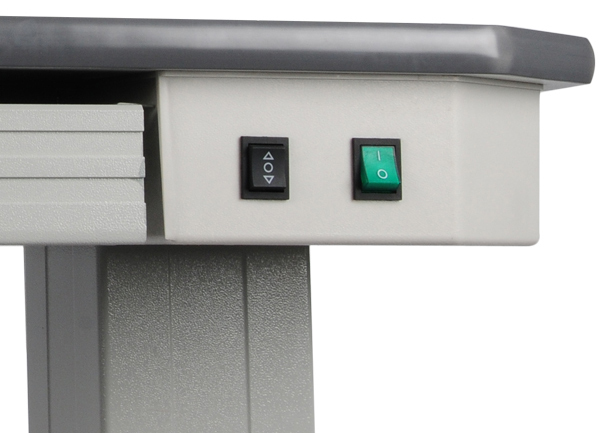 Controls are located on the table top. The ET-800 features an integrated drawer beneath the table top, which allows for convenient storage for ophthalmic supplies. The table provides easy access and is wheelchair accessible. Simply roll the table to your desired location and lock the wheels as needed. The table has outlets to connect up to two equipments. The table can be used for disabled patients. The ET-800 was crafted using quality materials, including high-grade casters to ensure safe and stable movement.